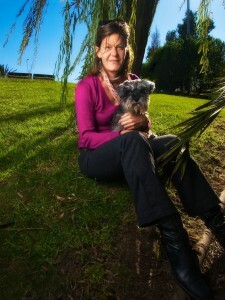 I met Susie (a pet psychologist) near the beach on a really lovely day. She was with a clients dog called Molly who was quite good fun and was pretty easy to photograph if I called her name or waved a treat just out of camera shot. I wanted to find a place where there would be a background not too complicated so they can run the text, I was thinking of using the sea but at that time of day the areas of shadow near the sea were limited and when we were walking through a park I was taken by the colour saturation of grass and sky, there was a very hyper-real thing to everything. In the end we found a Willow tree that gave some shade, though a quite strong wind meant the branches were all over us and playing havoc with the brolly on the flash, also Susie had to trap a large palm frond under her foot (just out of shot) and I was being attacked by another one behind me! Getting a shot I liked meant trying to get the sun to act as a hair-light, it was flaring directly in to the camera because of the wide angle lens but I quite like some flare at times so did not worry too much. All in all an easy shoot with a nice person and I got to ride home along the beach enjoying a fantastic day.